You can help ensure safe water! The Harpers Ferry Water Works gets its water from Elks Run and Elk Branch, a tributary of Elks Run. The figure above shows these two stream segments and the area of “critical concern” adjoining them. Land uses upstream of Elks Run can affect the quality of your drinking water. Currently, the principal use of the Elks Run watershed is farming with 1,859 acres of cropland and 2,309 acres of pasture in the entire watershed. 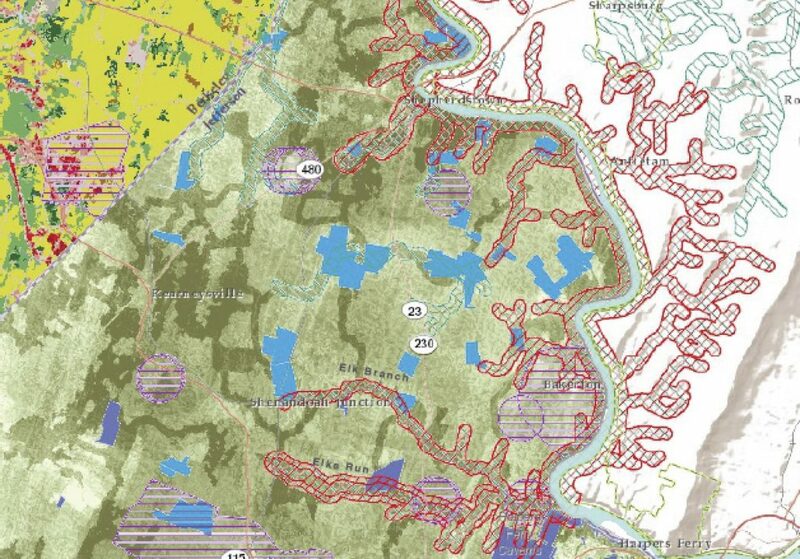 Houses, towns and roads make up 1,726 acres in the entire watershed. Everything done in a watershed impacts the quality and quantity of the water that travels down to our water treatment plant. Pesticides, fertilizers, household hazardous wastes, stormwater run-off from impervious surfaces, construction run-off, litter, and improperly maintained septic systems can leak into the water supply. The Harpers Ferry water treatment plant treats raw water for human consumption by removing disease-causing organisms, including viruses, bacteria and algae, and suspended solids such as sediment. The Harpers Ferry Water Works is a partner with West Virginia Rivers which has created the Safe Water for West Virginia program to help utilities and citizen groups with watershed protection. The local program – Safe Water Harpers Ferry – has its focus on Elks Run. These efforts will help protect your source water from contamination, reduce the cost burden on the water treatment plant, and minimizes the possibility of contaminants reaching the finished (treated) water supply.